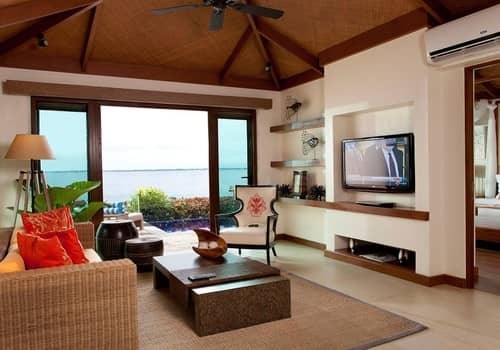 There are a lot of luxury resorts in Mactan, but none of them is like The Crimson. This 5 star resort offers the ultimate all inclusive experience for both couples and families with small children. 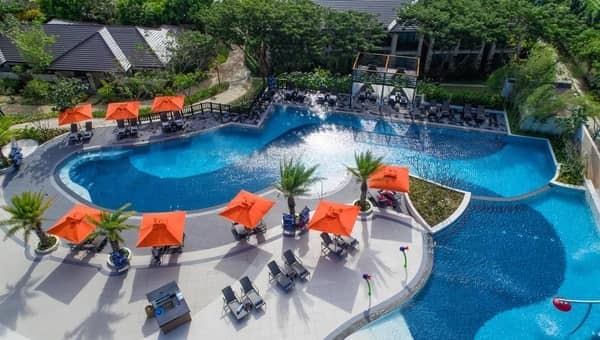 If you plan on spending a few days in Cebu, and prefer to have everything available right in your hotel, then this is the place you should go to. Located at a remote and private part of the island, the Crimson Resort and Spa provides guests with the perfect escape from reality. 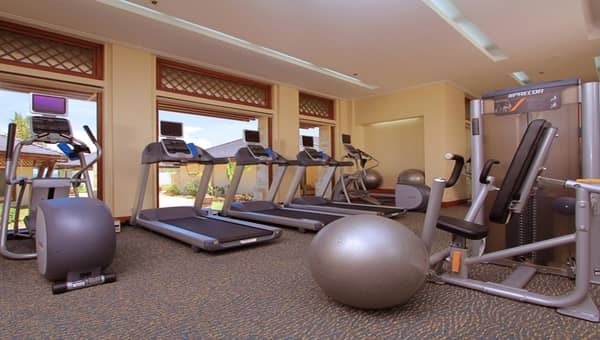 All of the facilities are top notch, as well as the rooms, dining and activities offered by the hotel. 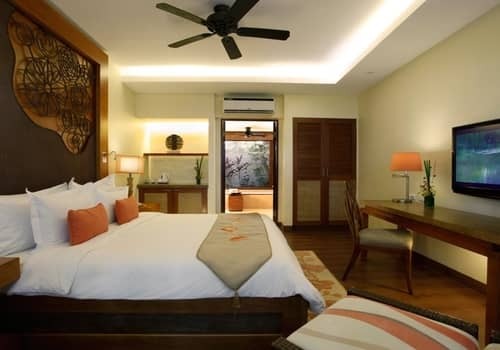 This resort is truly a place where luxury meets comfort, delivered with an extremely friendly and professional service. While the romantic atmosphere is especially suitable for couples, this luxury resort will make anyone who stays there feel like royalty. Crimson is a Filipino chain of hotels which enjoys a stellar reputation for many years now. This is primarily due to the high quality service they provide, and the friendly and helpful service. Even though this is a huge property, you still get a lot of personal attention everywhere you go. 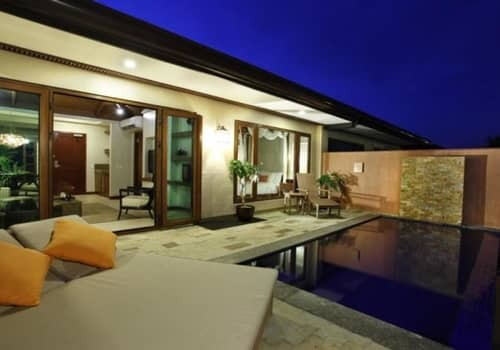 Villa accommodation even have a personal host, providing butler service which is customized for your requests. World class design and everything is clean and extremely well kept. The rooms are all large and are cleaned on a daily basis. 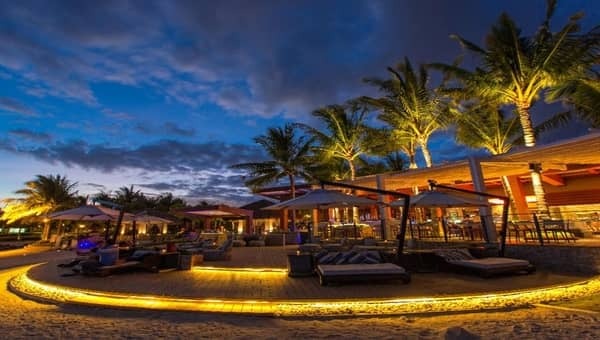 The whole place really does an amazing job at creating a feeling of luxury and romance, with a hidden island resort vibe to it. That said, we did notice some of the rooms are a bit old and in need of a slight facelift. Even the most basic rooms are large and very well stocked. The design is simple and homely, but with a touch of elegance. 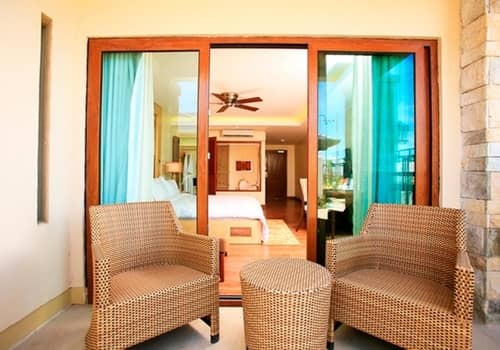 All rooms come with a private balcony, as well as a complimentary fully stocked mini bar. 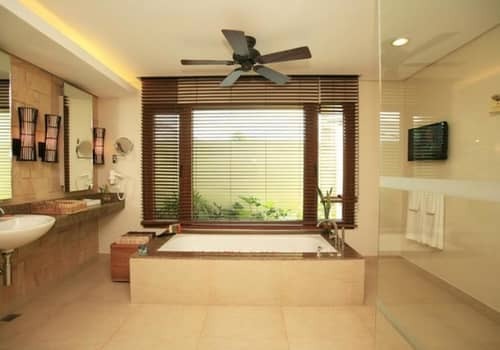 Amenities and toiletries are of the highest level, and the Villas even have a small private pool installed in each of them. The beach in Mactan isn't spectacular like at other popular destination, but Crimson has one of the best private beaches on the whole island. On top of that, the infinity pool is amazing and located right above the beach area, providing a spectacular view. There's also a small pool for kids, as well as another pool at the spa area. 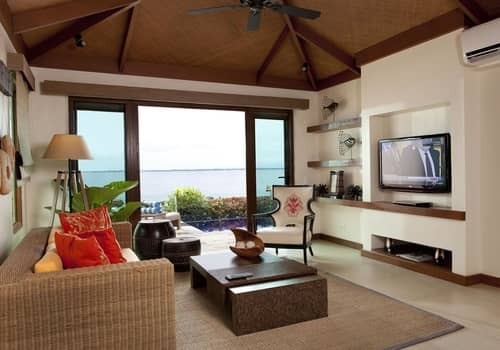 All in all, we'd say Crimson Resort is by far the best among Mactan hotels in this category. 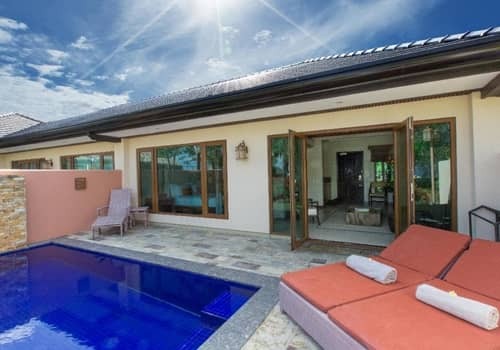 Even though it's located only 20 minutes drive from the airport, the resort is very secluded and gives out a feeling of privacy and peacefulness. Getting in and out of the resort independently is quite troublesome, as you'll need to drive through a narrow dirt road. This isn't the most convenient setup, especially at night. Still, the upside is you get to enjoy complete privacy and quietness at an exclusive setting. Thanks to its large size and high popularity, the Crimson is able to maintain extremely competitive rates. They actually rival the prices of 4 star resorts in Mactan, and of course the level of accommodation you get in return is far superior. 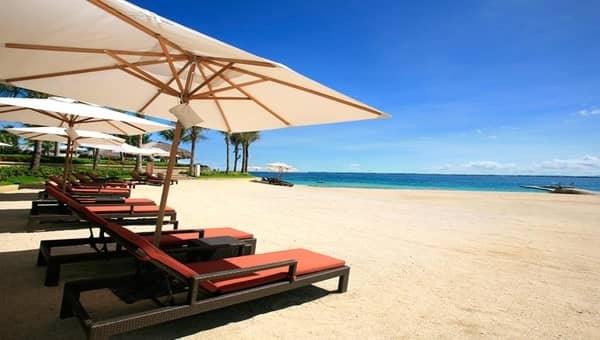 For us, this makes Crimson Resort one of the best choices on Mactan island. The first impression we had of the resort was already created during our drive there. The narrow pathway which takes you off the main road really helps create a sense of a remote, exclusive location. Once you actually get there, the beautiful and well maintained reception area will only help strengthen that notion. You’ll be immediately greeted by a smiling staff member who’ll serve you a refreshing welcome drink, and know immediately you have reached a true tropical paradise. The resort was founded almost 6 years ago, and have since managed to sustain its status as one of the leading hotels in Mactan. Spreading over 6 hectares of land, there are no less than 290 rooms to choose from. You can pick your location based on your vacation priorities – do you want to be by the beach or by the spa? Near the gym or close to the dining area? Just let us know and we’ll do everything we can to pick the right room for you. 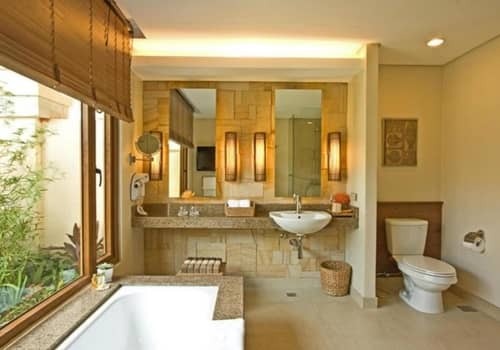 Still, even though the resort is quite big, it’s extremely well designed and easy to move around in. This isn’t a complicated resort like the Shangri-La in Boracay for example, where you have to catch a car to go from one place to another. No matter where you’ll end up staying, everything will always be just a short walk away. All rooms come with all the amenities you’d expect from a high end resort. These include a 42″ LED TV, air conditioning, free WiFi, an electronic safe, a fully stocked mini bar and coffee / tea making facilities. All rooms have a private balcony, overlooking either the ocean or the garden, and the villas also have a private dipping pool in them. 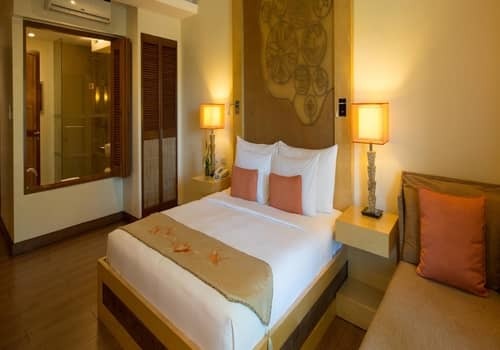 Some rooms are also especially equipped to accommodate people with disabilities, making Crimson the only truly accessible resort in Mactan. If you are a senior citizen or a person with special needs, let us know and we’ll make sure one of these rooms is reserved for you. Do Guests Like The Crimson Resort? 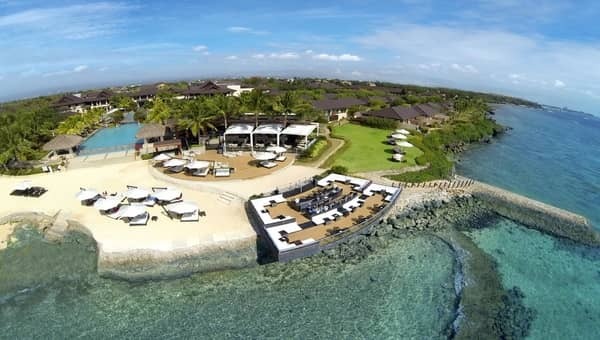 The Crimson resort in Mactan is one of the most famous hotels on the island. For many years now, they have enjoyed an impeccable reputation as being the perfect combination between luxury and comfort. To further support this, the parent company is a well known local corporation, famous for their successful chain of luxury hotels. 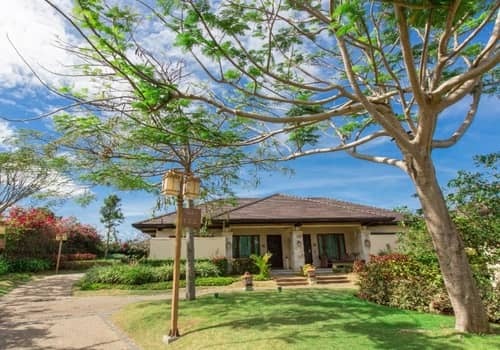 Tripadvisor shows 3781 different reviews for this hotel, one of the largest collection of reviews we've ever seen for any resort in the Philippines. We couldn't possibly go over all of these, so we mainly focused on finding the most polarized ones – the people that really loved or hated the place. Crimson is ranked as the 4th best hotel in Cebu, with only 4% of guests rating their stay there as below average. Most praise was given to the food, the pool and the personal service by the villa hosts. Complaints were rare, and focused mostly about the remote location and problems with TV reception. 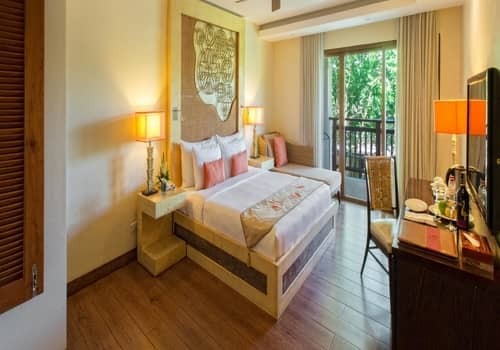 There are also 1150 reviews at Booking.com, where the average score is 8.5 - making Crimson the 2nd highest 5 star hotel, right after the Shangri-La. 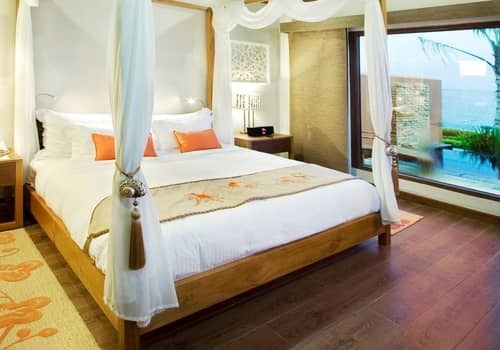 this is also the case over at agoda, where 3050 guests have given the resort a total score of 8.3. 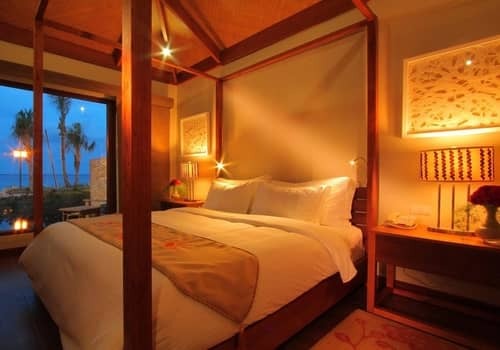 At both sites, people praised the staff, the all inclusiveness of the resort, and the fantastic romantic atmosphere. The most common complaints were about room's wear and tear, saying they are need of a slight renovation. 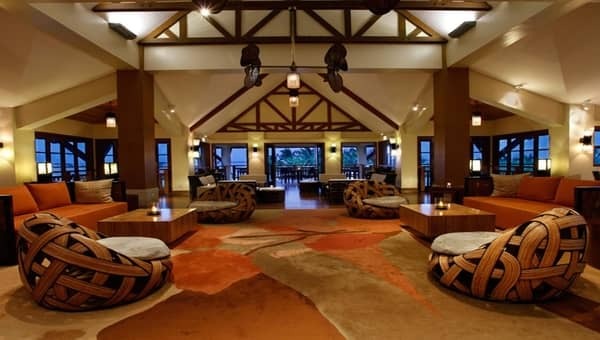 Other than that, many people complained about the remote location and some suggested the resort is overpriced. Crimson resort Mactan is a somewhat similar to all the other 5 star resorts on the island, so the small nuances really matter a lot. 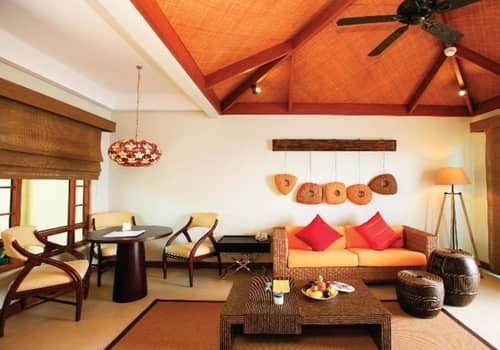 That said, we feel it’s not entirely fair to compare it with the most luxurious resorts on the island – such as the Abaca boutique resort, Shangri-La and Plantation Bay. These 3 really stand out as the most luxrious and impressive hotels in Mactan, but they each at least double if not 3 times more than Crimson. 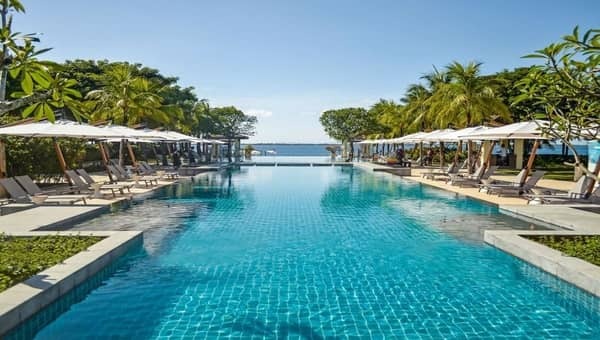 So, for us, the most relevant comparison is the Mövenpick Hotel – which is roughly at the same price range and offers similar standards of quality. 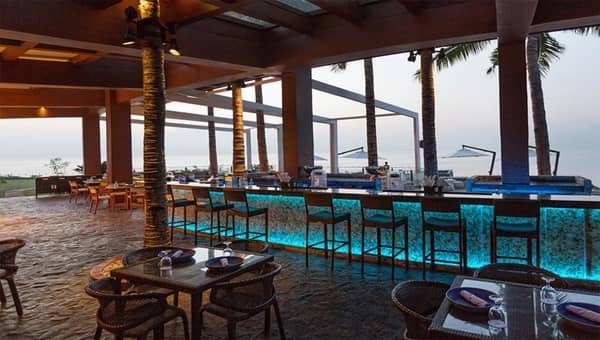 If we have to generalize, we’d say Crimson is slightly more luxurious and has a better all inclusive package available, while the Mövenpick offers a better location and is more suitable to young people thanks to their great bar. This is also well reflected by guests reviews – both are very well liked but the Crimson enjoys a very slight edge across all booking websites. The thing which makes the Crimson stand out is the complete package of services and amenities they provide. As mentioned, this is a perfect place for people who care less about leaving the hotel, and prefer to have everything available on site. The beach and pools are a particular highlight, but as with any all inclusive resort, the small details are the most important. This is exactly why recommend the Crimson resort, where attention to small details is excellent. Service might be a bit slow at times, but each guest enjoys full attention and professional treatment by all staff members. This is especially true for the 4 restaurants and bars, where you can expect a real fine-dining experience, but also for all other facilities, such as the spa or the gym for example. It is clear this hotel aims to please its guests and give out a feeling of class through everything it does. 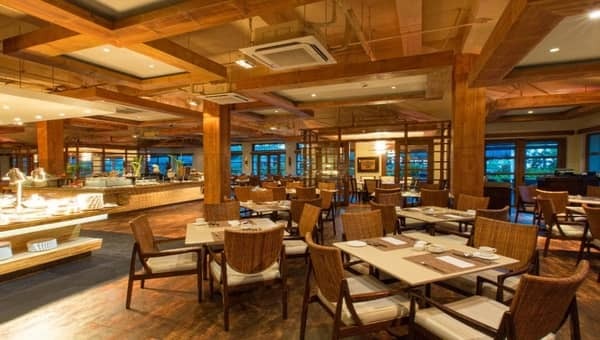 They also do a great job at catering to special needs – as mentioned they are the only accessible hotel in Mactan, and also the only one to be Halal certified. These are just small examples which demonstrate how seriously they take their guests. There’s also a very nice kid’s playground, nicknamed the CrimZone. It includes a relatively large kiddie’s pool, as well as an assortment of toys and inflatables. Babysitting services are also available for an hourly rate of roughly 12$. 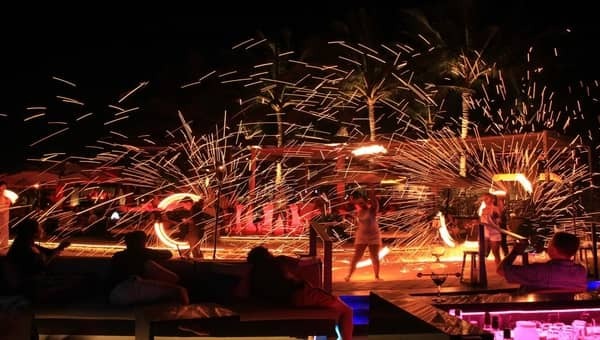 A wide range of inhouse activities and events are also available to guests of all ages, with the evening show at the restaurant being a particular highlight. Extreme watersports, kayaking, snorkeling and even diving are all available at the resort’s own reef, located right by the beach. Lastly, there’s one special service which we think our couple clients would really like and that’s the romantic private dinner at the beachfront. If you want that to be set up, all you have to do is let us know in advance and we’ll have taken care of. To sum it all up, there are many reasons why the Crimson Resort is considered one of the best hotels in Mactan. 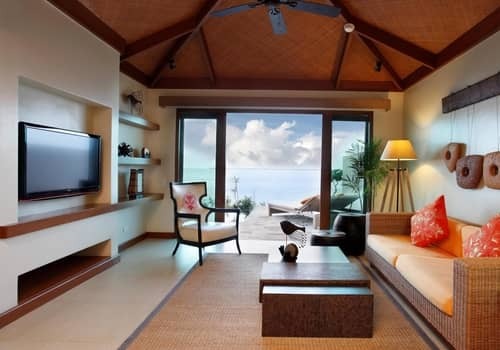 We hope this review has helped you understand the 5 star hotel landscape on the island better, so you can see what separates Crimson from similar hotels. For us, the bottom line is that this place offers fantastic value, for only a fraction of the price others charge. This really makes the Crimson one of the best choices for those who seek a luxurious setting at a relatively affordable price. These rooms are located at either the first or second floor, and so they are always easy to reach. 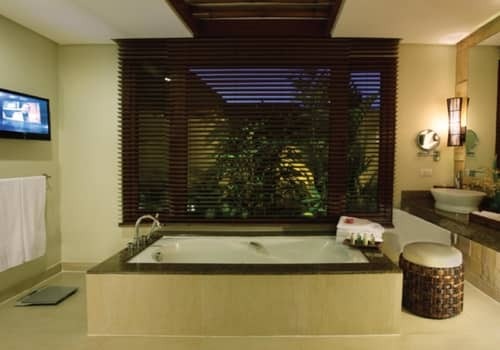 They each have their own private balcony, as well as all the usual amenities and services provided by the resort. The rooms are all 36m2 and designed to accommodate 2 adults and 2 kids. 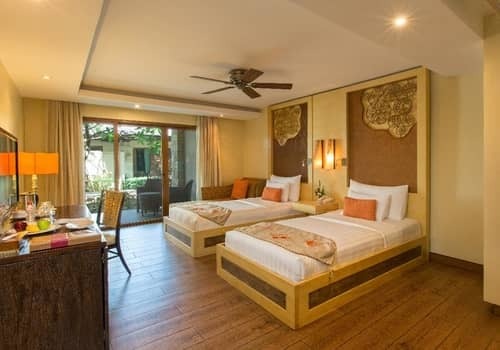 Either a king size bed or 2 queen size beds are provided according to your preference, and an extra single bed can also be added for an additional fee. 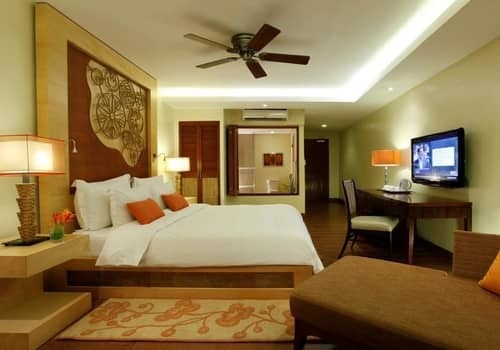 These room are located at ground level and you have your own private garden area. They are each 44m2 and can comfortably fit in two adults and two children. 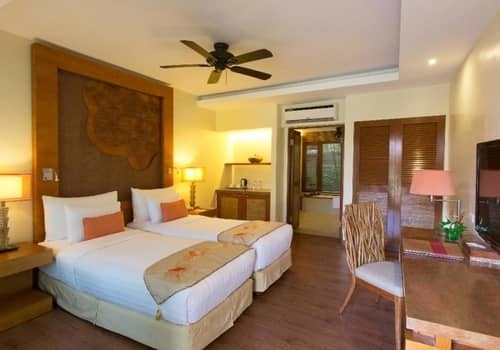 The room comes with either 1 king size bed or 2 queen size. 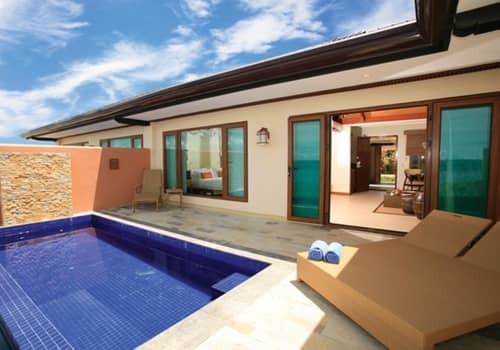 These Villas are 115m2 in size and are located at the garden area, not far from the pool and beach. They each come with a private balcony which has a small dipping pool in it. 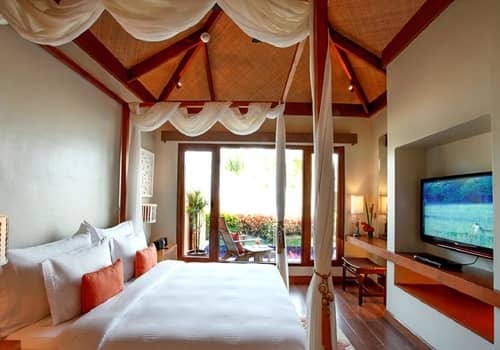 Villas have 1 king size bed and 1 sofa in the living room which can be turned into a bed as well. 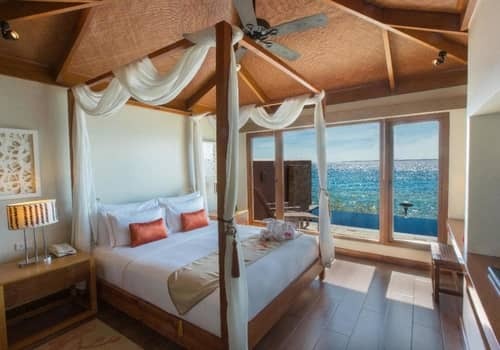 This is the most expensive accommodation option in the resort, and it costs 80$ more per night compared to the garden villa. it’s the same size (115m2) but is located right by the beach. Rooms come with 1 king size bed and sofa bed in the living room.